Why do you run: ? I run to feel energized and stay healthy. The competition of racing adds an element of fun to my running. I make new friends at races and enjoy trading victories with others who run about my pace. Running Accomplishments: : Age group medals in all 14 registered races I ran in 2018, and 11 of them were 1st place. No new PR's, but decent times for a 58 year old guy. Two years in a row I won first overall in Track Club's Age Graded event of the Summer Series. 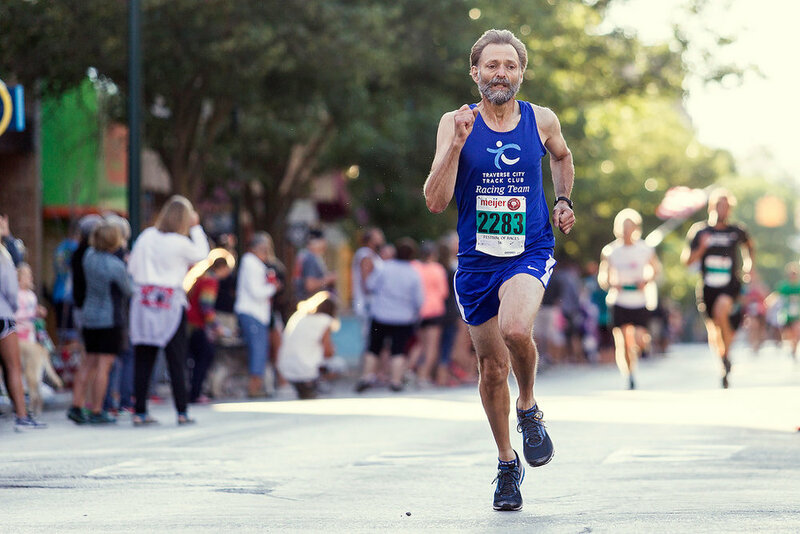 In the 2017 Cherry Festival 5k, I scored my best age percentage of 80.8. Favorite Race(s): Bayshore 10k, Cherry Festival 5k, VASA Trail Run, TCTC Summer Series. Favorite Running Race Distance: : Anything under about 10 miles. After that, my joints start to talk to me. Favorite Pre-race meal: Spaghetti, garlic bread and a tossed salad. Any Goals for 2019: Stay healthy and active, keeping up a regular schedule of solo runs, track club events, and open races. I strive to improve my age percentage as I get older, and also to encourage others in every race and group event I do. Best running advice given to me: Listen to your body. Dumbest running moment: Missed the start of a race while in a porta-pottie. What other interests do you have outside of running? Being a musician, gardener and woodworker; staying connected with the Traverse City community. How do you feel about and how do you plan to represent the Traverse City Track Club as a Race Team member? I feel it is important to encourage all runners, whether they are fast or slow. I will represent Traverse City Track Club by supporting others, and volunteering at local races.